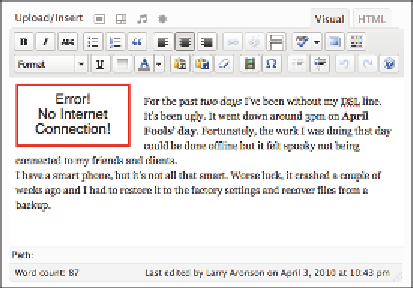 need any of those features in a blog post, HTML editing mode is essential. border: solid red; font: large sans-serif; text-align: center;"> Error! In this situation, you must be careful about extra white space in the content. and paragraph elements to preserve the lines as you see them in visual mode. mode. he line break ater the word “Error!” is intentional in this case.